In the spirit of the whole “new year, new beginnings” vibe, we’re looking forward to a fresh batch of brand-new babies in 2019. Just what will we call these bundles of joy to be? Well, according to Nameberry, the hottest baby names of 2019 will be inspired by animal names, nicknames, and precious gems. If you’re looking for a bit of Jewish flavor on these trends, you’re in luck: Many Hebrew names are based on animals, and you can find you can find plenty of unisex and one-syllable Jewish names here. 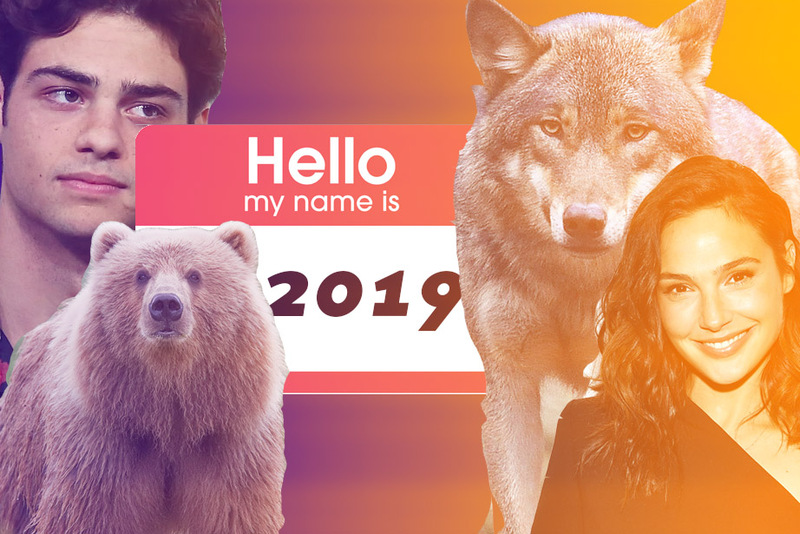 Using Kveller’s super-secret formula — a complicated (read: random) process by which we look at the most popular names of the past year as well as investigate emerging trends — here are our predictions for the hottest Jewish baby names of 2019. Abigail means “my father’s joy,” and it’s constantly on list of popular names in the country. With the last season of Broad City coming up, why not honor the series’ co-creator and co-star Abbi Jacobson? Esther/Este — After a year of royal weddings and babies, let’s remember the OG Queen, Esther. Este is also the name of one of the members of the popular band Haim. Mila — Mila is not a Hebrew name, but it is the name of amazing Jewish actress Mila Kunis, who opened up about celebrating Shabbat with her kids. Miriam/Miri/Midge — If you want to give your kid a marvelous name, name her Miriam “Midge” Maisel, the titular character in The Marvelous Mrs. Maisel.Miriam was also a biblical badass, the sister of Moses and Aaron, she led the Israelite women in dance after crossing the Sea of Reeds. Naomi — Naomi means “pleasant,” which, as a name, it really is. Naomi is the biblical Ruth’s mother-in-law. A newly-famous and very young Naomi is Jewish activist Naomi Walder, who, at age 11, a shared an iconic magazine cover this year with Barbra Streisand. Odeya/Hodaya — This name means “thanking God.” It’s also the name of up and coming actress Odeya Rush, who was in Ladybird and Dumplin’. Ruth — She’s notorious — both in and outside the bible. The heroine of the Book of Ruth, the biblical Ruth is the most famous Jewish convert. Then, of course, there’s the amazing Justice Ruth Bader Ginsburg. Who better to name your children after? Yael — Yael is Hebrew name that means “ibex.” There’s also Yael Stone of Orange is the New Black, who gave birth to her first baby this year, and Yael Groblas of Jane the Virgin. Abe — Abe comes from the name of the first biblical patriarch, Abraham. Aryeh — With the last season of Game of Thrones upon us (sob! ), names inspired by the fantasy show will be trending. While Arya is not a Hebrew name, Arieh (or Aryeh), which means “lion,” most certainly is. Ben/Benjamin — Son of the right hand, and Jacob’s youngest son. It’s also the name of Mrs. Maisel‘s season 2 beau, played by Zachary Levi (who, surprise, is not Jewish!). There’s also the very talented Ben Platt. Dov — This beautiful name means “bear” in Hebrew. Ezra — The name Ezra means “help.” Some famous Jewish Ezras are Ezra Koenig of the band Vampire Weekend and actor Ezra Miller. Isaiah — This name comes from Yeshayahu, which means “the Lord is my salvation.” It’s also the name of Rashida Jones and Ezra Koenig’s secret (well, not-so secret anymore) baby. — Jonah in Hebrew means “pigeon” or “dove.” Jewish actor and director Jonah Hill has a particularly successful year in 2018, his directorial debut, Mid90s, premiered and he starred in the harrowing Netflix TV show . Levi/Levy – Levi, the third son of Jacob and Leah, was one of the 12 tribes of Israel. According to Nameberry, one of 2019’s naming trend is last names that are first names, and Levy is a perfect one. Eugene and Dan Levy of our favorite show, , come to mind. Noah — Noah was the third most popular name in 2018 and we anticipate that it will stay just as beloved. Breakout star Noah Centineo, who played Peter Kavinsky in is bound to make the name even more popular! Zev — Zev is the Hebrew word for “wolf” and a pretty amazing Jewish name. Ayal/Eyal/Ayalla — Eyal means “deer.” Eyal Shani is also the name of a popular Israeli chef whose restaurants have just landed in the U.S.
Ariel/Arielle/Ari — The name means “lion of God” in Hebrew and it works well for girls and boys. It’s the Hebrew version of Leo, another very popular name. Ran/Rani — Ran means “joyful” in Hebrew, and lets face it, we can always use more joy. Rani is the name of Kate Hudson’s newest baby (mazel!). Chen — Chen means “grace” in Hebrew. Grace is also the middle name of Adam Levine’s baby girl, who was born in 2018. Gal — Gal means “wave.” It’s also the name of the fabulous Wonder Woman actress, Gal Gadot. The post The Hottest Jewish Baby Names for 2019 appeared first on Kveller.